Is it possible to reliably repair this level of base board damage? 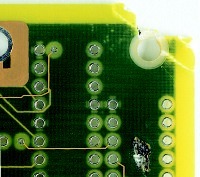 Can you fix a broken corner on a circuit board reliably? Do you consider re-balling ball grid array (BGA) components to be a reliable procedure? Should you attempt to repair a damaged plated hole with an inner layer connection? Your opinion and experiences with issues such as these are important, since the reliability of most circuit board repair and rework procedures are a matter of industry consensus. So, how do you know if a rework procedure will produce a reliable result? Most rely on a concept and term known as conformance level. The IPC defines conformance level as an indicator of how closely the repaired or reworked circuit board will be to the original specification - the board or assembly as it would be without damage or defect, and prior to rework. Should you attempt to repair a damaged plated hole with an inner layer connection? Conformance level has a direct bearing on reliability, and is a grading system for procedures established from industry consensus, opinion and experience. Three basic levels of conformance are applied to the end result for every rework or repair procedure. Significant variance with the physical character of the original and most likely varies with some of the functional, environmental serviceability factors. Per IPC 7711/7721 Guidelines, Class 3 products must use procedures rated high - unless it can be demonstrated that a lower level procedure will not adversely affect the product's functional characteristics. Class 2 and Class 1 products should use procedures rated high for assured safety and dependability, but medium or low-level procedures can be used if it has been determined that they are suitable for the specific product's functional characteristics. v When performing repair or rework, the goal is to follow methods and procedures that will deliver the highest level of conformance. The relationship between level of conformance and level of reliability is not direct, but an implied correlation exists. Remember, levels of conformance are established by the collective experiences of many rework and repair practitioners in the field, and their results have been collected and documented by members of the IPC with help from such organizations as the Naval Surface Warfare Center (Crane, IN). In many cases, the individual manufacturer or contractor must determine whether or not a particular type of rework is something that should become a standard practice. Additionally, operator skill has a direct bearing on the level of conformance achieved, as well as ultimate product reliability. Common sense comes into play, such as proper maintenance, setup and operation of equipment; proper site preparation; good process development (developing correct profile recipes for a hot-air rework machines); and avoiding improper materials usage (using one no-clean cored wire solder with a different no-clean flux). Adhering to and choosing the highest level of conformance in rework and repair procedures alone won't guarantee maximum product reliability. However, highest conformance is a good philosophy to follow to obtain the best possible outcome - when combined with a high operator skill level and an efficient operation. See Guidebook Section 1.0 Foreword for more information.